Lawyers typically work long hours that don’t leave much time for personal pursuits. When they have a baby, however, they may need to slow the pace for a while, and many firms are helping them do that with generous parental leave policies. Large law firms generally offer 16 to 18 weeks of paid leave for mothers and approximately six weeks for fathers, Bloomberg BNA found by contacting several major firms. Many firms also allow lawyers to add paid sick or vacation leave or unpaid leave to extend their time off. It’s fairly common for major law firms to offer lawyers 16 weeks of paid maternity leave, but there’s “a little bit more of a range in paternity leave,” Stephanie Biderman, a managing director at legal recruiter Major, Lindsey & Africa, told Bloomberg BNA Aug. 3. “Typically, I see at least one month” for paternity leave, she said. Bloomberg BNA contacted 31 major law firms. Of the 10 that responded, the most common lengths of parental leave for lawyers in the U.S. were 16 to 18 weeks for mothers or primary caregivers and four to six weeks for fathers or secondary caregivers. “Some firms are no longer characterizing it as maternity or paternity leave but are describing it in a gender-neutral way,” Biderman said. Hogan Lovells grants the most paid leave to primary caregivers—20 weeks—of the firms interviewed by Bloomberg BNA. Hogan Lovells and Mayer Brown give 12 weeks of paid leave to primary caregiver fathers. Several firms give 18 weeks to mothers or primary caregivers, including Baker McKenzie, Cleary Gottlieb, Kirkland & Ellis, Norton Rose Fulbright, and Wilmer Hale. The most generous leave for fathers who aren’t primary caregivers was the 10 weeks given by Kirkland & Ellis and Reed Smith. Some firms with lower official leave levels often grant more leave to attorneys who need it. “In many instances we make allowances for extra paid leave, going above the times listed” in the formal policy, Lara Hamm, communications director at Jackson Lewis, told Bloomberg BNA in an Aug. 3 email. The paid parenting leave offered by law firms is somewhat comparable to that offered by large financial institutions, where paid leave for mothers or primary caregivers ranges from 13 to 28 weeks and two to eight weeks for fathers or secondary caregivers. Vault researches workplace features in various companies and industries. Moody based his remarks on Vault’s surveys of associates at major law firms. “As for secondary parental leave, we’ve seen that move up a little more in both industries, but there’s not really an industry norm,” Moody said. “The secondary care leave lags far behind” the primary care leave, with policies granting two, four, and six weeks’ paid leave to secondary caregivers, he said. Of course, the availability of leave is irrelevant if lawyers are afraid to use it. “We see a lot of associates saying that they worry about taking leave and being able to stay on track” for partnership and bonuses, Moody said. “Many associates either feel that they were punished or worry about being punished for taking a long leave,” he said. Some firms say that taking parental leave doesn’t damage or delay an associate’s chances of being promoted to partner. “We have had women promoted to partner while on maternity leave,” Michael Lynch, Reed Smith’s chief human resources officer, told Bloomberg BNA Aug. 3. Lawyers returning from parental leave may find it difficult to hit the ground running at their former pace, but the idea of offering new parents a modified schedule may be gaining acceptance. “There’s been a little more support in helping attorneys come back to work after their leave,” Biderman said. “I think that firms are starting to be more aware and trying to figure it out, with varying degrees of success,” Moody said. Some firms prorate the number of billable hours that returning associates must work to qualify for a bonus, he said. Many firms try to accommodate returning lawyers by offering reduced schedules or work-from-home arrangements. Some offer emergency child care at their firms or contract with a day care center that provides back-up child care. Hogan Lovells gives lawyers “some autonomy and flexibility to script a schedule that provides the least amount of stress in their day,” Eve Howard, the firm’s regional managing partner for Washington, told Bloomberg BNA Aug. 1. “We work with everyone to talk about what they need,” she said. The firm’s agile work program can include remote work, a flexible schedule, or reduced hours. In addition, Hogan Lovells offers lactation rooms, a pump and ship service for breastfeeding lawyers who are traveling for work, and an affinity group for new parents, Howard said. Reed Smith also contracts with a company that ships breast milk for nursing mothers on business trips. “We don’t look at it as a cost issue. It’s about making life easier for your people,” Lynch said. Reed Smith also allows returning lawyers to work a reduced schedule for three months at a prorated salary, Lynch said. At Wilmer Hale, lawyers may telecommute for up to 40 percent of their full-time work schedule, or they may reduce their work schedule by up to 40 percent with a corresponding salary reduction. Some of the firm’s offices have on-site emergency child care facilities. 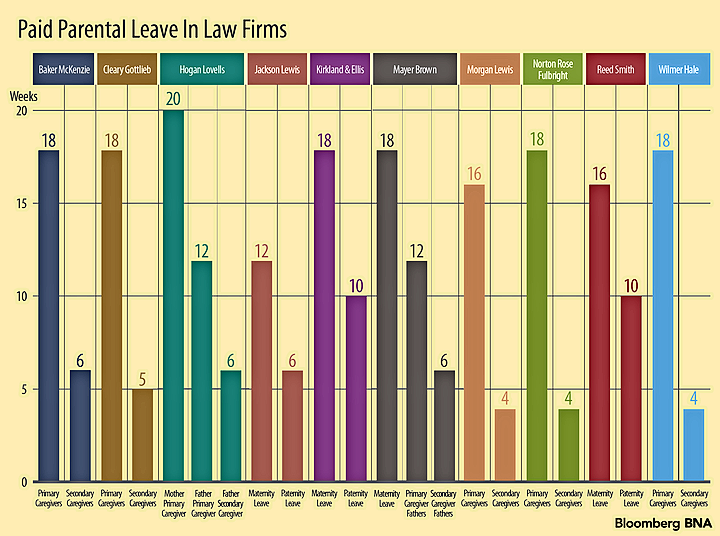 Even the law firms at the lower end of the leave continuum are ahead of most businesses, at least for maternity leave, statistics indicate. Thirty percent of U.S. companies offer paid maternity leave, and 24 percent offer paid paternity leave, according to the 2017 Employee Benefits Survey from the Society for Human Resource Management. On average, organizations that offered paid leave for a new parent provided 41 days for maternity leave and 22 days for paternity leave, SHRM said. With regard to law firms, the SHRM study found that 48 percent offered paid maternity leave, and 36 percent offered paid paternity leave. 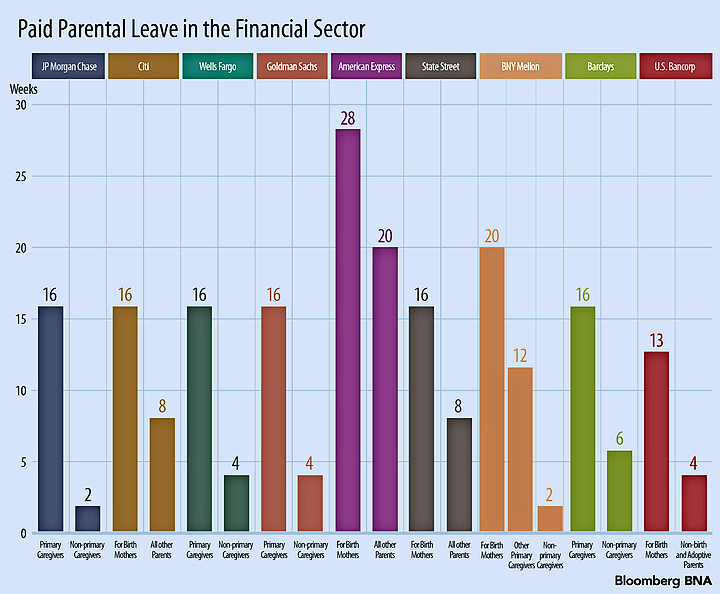 The median amount was 60 days of paid maternity leave and 30 days of paid paternity leave. The law firms surveyed by Bloomberg BNA, which include some of the largest in the country, reported longer maternity leave benefits. The major firms’ paternity leaves varied widely. The law firms seem to consider their parental leave policies a good business strategy. Lynch said Reed Smith expanded its parental leave policy in 2014 after “keeping an eye on what other firms are doing” and receiving some “advocacy” from a women’s group at the firm. “It was an easy decision,” he said. “The bottom line is we want to attract and retain the best legal talent,” said Howard of Hogan Lovells.